On Dec. 18, Keck Medicine of USC became the world's first medical center to implant a responsive brain device newly approved by the Food and Drug Administration (FDA) to treat epilepsy, with potential to help millions of people worldwide. The treatment involves surgical implantation of a device that detects and then directly responds to abnormal brain activity to prevent seizures before they occur. In a three-hour surgery, USC faculty physicians implanted the device in a 28-year-old Lakewood, Calif., woman who was diagnosed with epilepsy in 2004. "I'm just so lucky to be here at USC," said Kathleen Rivas, an aspiring journalist who sought care from the university's student health center in 2009 while earning her master's degree. "Without faith and trust in my neurologist and neurosurgeon, I don't know where I'd be. My life is in their hands." Rivas elected to have the implant because medication had not fully controlled her seizures. Over the next few months, her doctors will program the device to detect specific brain activity indicative of a seizure's onset. The device is the world's only responsive neurostimulation (RNS) system approved for clinical use. USC physicians have been studying the technology since 2006 and are among the first authorized to prescribe its use since FDA approval on Nov. 14. "This has the potential to be a game-changer in the care of patients with epilepsy," said neurologist Christianne Heck, M.D., M.M.M., associate professor of neurology at the Keck School of Medicine of USC, medical director of the USC Comprehensive Epilepsy Program and principal investigator of the device's clinical study at USC. "Every individual's epilepsy is different. Unlike other neurostimulators on the market, this system looks for just the right circumstances to stop a person's seizure from happening." Epilepsy is a debilitating neurological condition that causes recurrent seizures, affecting approximately 65 million people worldwide including nearly 3 million in the United States. Those who can tolerate medication and whose seizures are completely controlled usually lead a normal life, but the disease can be devastating for the up to 40 percent who experience uncontrolled seizures. 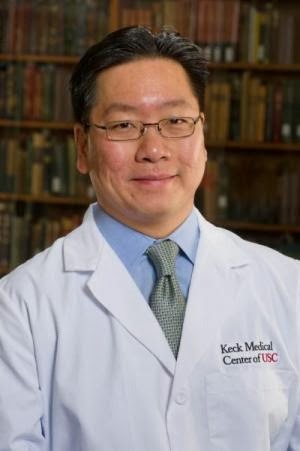 "We have become very good at finding and surgically removing the areas of the brain where these seizures start, but we have limited options when a person's seizures begin in critical zones, such as those that affect speech or movement," said neurosurgeon Charles Liu, M.D., Ph.D., professor of neurosurgery and neurology at the Keck School of Medicine of USC, surgical director of the USC Comprehensive Epilepsy Program and director of the new USC Center for Neurorestoration. "Devices like this provide an option for the population with epilepsy who live with uncontrollable seizures because no available treatment works for them. Implanting it is probably safer than traditional epilepsy surgery, because we're not taking anything out." The work that Liu and Heck committed to building USC's Level 4 epilepsy program over the last three years has laid the foundation to establish the Center for Neurorestoration. "Thanks to Dr. Heck and Dr. Liu's innovation and perseverance, Keck Medicine of USC has a Level 4 epilepsy center, the highest level of medical and surgical evaluation and treatment available for patients with complex epilepsy," said Scott Evans, Pharm.D., M.H.A., CEO of Keck Hospital of USC and USC Norris Cancer Hospital. "The addition of this groundbreaking therapy to our arsenal is testament to our team's dedication to improving the quality of patients' lives." "Our faculty physicians and scientists are constantly striving to discover new solutions to the most complex diseases, conditions and disorders," said Carmen A. Puliafito, M.D., MBA, dean of the Keck School of Medicine of USC. "The USC Center for Neurorestoration is a prime example of that pioneering approach—proposing a fundamental departure from current best practices in neurorehabilitation and bridging the gap between science and medicine." One of the center's current projects includes improving upon the RNS system by testing different levels of electrical stimulation on brain samples in the lab to determine the most effective level for seizure prevention. "Academic medical centers are centers of innovation and education that directly contribute to the medical breakthroughs that redefine health care," said Tom Jackiewicz, M.P.H., senior vice president and CEO of USC Health. "Dr. Charles Liu and Dr. Christi Heck are blazing a trail in neurological research and care that ultimately will change people's lives for the better. Keck Medicine of USC is proud to serve as a keystone for their efforts."